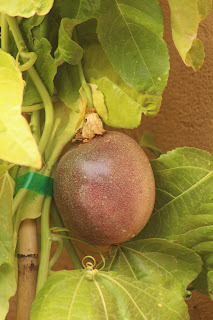 I am excited to say we have tasted our first home-grown passionfruit this week - just in time before heading back to England for a couple of weeks. I was very fortunate in that one of my Food as Medicine classes gave me a gift voucher at the end of their season of classes and so I bought some edible plants for our garden - including our passion fruit vine. The vine has thrived and the fruits are just ripening now. They fall off the plant, all round and solid looking but then you have to leave them at room temperature to wrinkle and ripen further. They are larger than any passion fruit I have ever seen for sale. Freshly picked on the left, and two day wrinkles on the right! It was tricky waiting for the first one to wrinkle....but we did! Then I cut it in half one morning and put the seeds on my homemade granola. So sweet and full of flavor. We are just eating them 'as is'. No need to do anything at all with them - just enjoy them, full of exotic flavors. However the biggest fan in our house has to be Harold, our parrot. He just adores passion fruit. I put the nearly empty half in his cage after I'd eaten most of it and left just a couple of seeds - oh, he was ecstatic!!! All you could hear were little crunches and happy noises from him! We've left strict instructions with his pet sitters to give him treats of his passionfruit while we are away! Passionfruit are basically just seeds with a gelatinous pulp coating. This means that they are are great source of fiber - so don't strain them just for the juice - enjoy the crunch too. Passion fruit also contain high levels of carotenoids - at least 13 different carotenoids - which are particularly good for our vision and skin. They are also rich in vitamin C - an antioxidant - especially when freshly picked and the nutrients are at their peak level. Surprisingly, they are also a good source of iron and have a somniferous properly, so if eaten before going to bed, help us relax and get a restful night's sleep. No wonder Harold had a nap after breakfast!!! I also love that its a winter/late fall fruit when most other things are all done with fruiting! 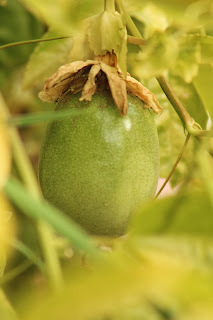 So get out there and grown a passion fruit - or buy some now from the farmers market or supermarket , while they are in season. Making Pumpkin Gnoochi - how should it taste? Where have all the gold stars gone?